Please spread the news we have two different shows each night at 7:30pm in the gym. So Much Talent we could not fit all in one show. There is a small donation at the door to enter. See you then. 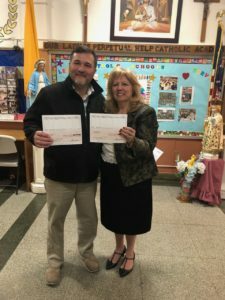 We thank Mr. Ed Griseti, for partnering with us for the Exxon/Mobil grant given to Our Lady of Lady Perpetual Help Catholic Academy. The grant provided to the school will be used to refurbish our science lab. Please continue to support the Exxon/Mobil company for their goodness to our children. Our Lady of Perpetual Help Catholic Academy formally opened its doors on September 12, 1927 as Our Lady of Perpetual Help School. The area now known as South Ozone Park was expanding, and moderately priced homes brought many young families to the area. 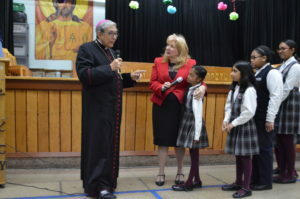 The strong Catholic community was in need of a place to worship and a place to have their children educated in the Catholic tradition and faith. The school building was inscribed with the words, “Pro Deo et Patria”, meaning “For God and Country”. The Dominican Sisters of Sparkhill, New York, provided the teaching staff of the new school. Thus began the fine tradition of high-quality spiritual and secular education, which has been the hallmark of our academy to the present day. The first class graduated in 1931. 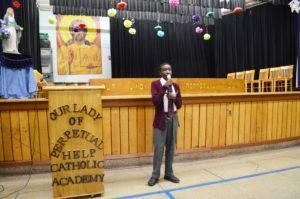 Expanding needs of Our Lady of Perpetual Help School required the addition of another floor to the building. Construction began in 1963, and a third floor was completed in September of 1965. 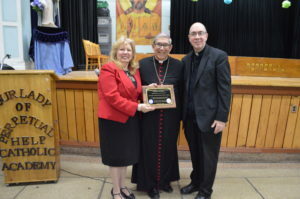 Since its opening day in 1927, Our Lady of Perpetual Help Catholic Academy has gone through many physical, technological, and community changes. 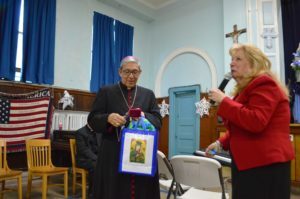 South Ozone Park, being a microcosm of New York City, has been and continues to be the home of a diversity of cultures and faiths. Therefore, we serve a large percentage of Catholic Christians and Christians, as well as a percentage of children from other faiths. At our academy, we partner with parents to provide children the best possible education and the opportunity to experience our faith-filled community. As our academy shares the educational mission of the church to spread Jesus’ teachings and to inspire a faithful response to these teachings, the principal, teachers, students, parents, and all constituents experience the power of prayer to build a personal relationship with God. This, in a broader sense, builds the Family of God, the Church. 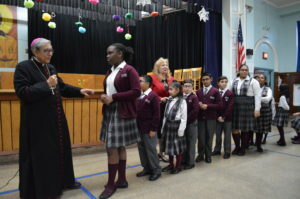 The students of Our Lady of Perpetual Help Catholic Academy consistently achieve outstanding test scores on New York State assessments, surpassing New York City, State, and other Catholic schools. Our students also are recognized as individuals of integrity, character, and spirituality within our community. 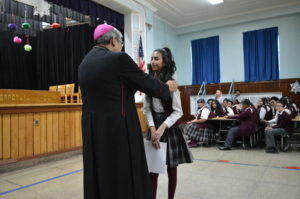 Further testament to the academy’s reputation is the fact that the students become candidates for acceptance into local and renowned high schools such as Archbishop Molloy High School, The Mary Louis Academy, Regis High School, and Townsend Harris High School. These successes are due to the students’ experiences of curricula in a variety of ways: teacher-directed instruction; interdisciplinary and multi-sensory instruction; differentiated instruction; use of technology; STEM hands-on science activities; math manipulatives and other student-engaging activities. Our students return as alumni, doctors, lawyers, teachers, etc., bringing their own children to their alma mater. Our students are the leaders of the future. It is my pleasure to inform all constituents of our academy that in this year our academy will receive Advanc-ED accreditation. 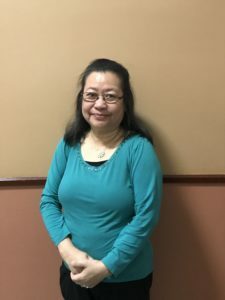 This accreditation process, which was begun last year, culminates this year with an Accreditation Engagement Review visit from the Advanc-ED-team in the Spring. As we have been engaged in strategic planning for several years, I look forward to the final process where our academy will reaffirm to all present that we, as an academy, are always seeking improvement in every area of this academy. As every viable academy must be engaged in an improvement journey that is continuous, it is very important that we have accurate information in order to properly shape our future. Therefore, I always look forward to your suggestions and comments. May God continue to bless you and your dear children. Hello parents! You still have time to fill out the Climate and Culture Survey. Here’s a complete video of “12 Months a Year,” the show we recently put on featuring students, alumni, and others. Video and Photos From Our Passion Play on Instagram! Please visit us on Instagram to see more photos and videos from our Passion Play!